In an annual survey conducted by the economists Robert J. Shiller and Karl E. Case, hundreds of new owners in four communities — Alameda County near San Francisco, Boston, Orange County south of Los Angeles, and Milwaukee — once again said they believed prices would rise about 10 percent a year for the next decade. With minor swings in sentiment, the latest results reflect what new buyers always seem to feel. At the boom’s peak in 2005, they said prices would go up. When the market was sliding in 2008, they still said prices would go up. “People think it’s a law of nature,” said Mr. Shiller, who teaches at Yale. That chart at the bottom of this post, constructed from Case-Shiller data, shows the reality: home prices have actually been pretty steady over time. In fact, if you look at a fifty-year period after World War II, home prices were absolutely steady. 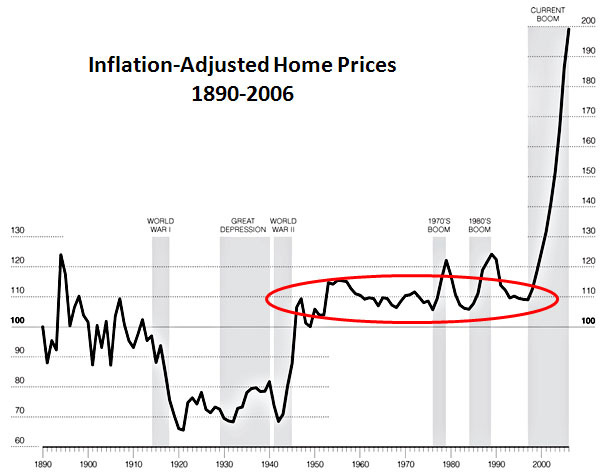 In 1947 the Case-Shiller index stood at 110, and in 1997, adjusted for inflation, it stood at 110 again. People are really bad at math. A 10% annual rise over ten years is a 150% increase. That’s pretty crazy. But most people have no sense for how numbers like that compound. In some areas, housing prices really have increased a lot. The house I grew up in cost $16,000 in 1959. Adjusted for inflation that comes to about $120,000 today. But even after the recent downturn it would sell for at least three times that amount now. In Orange County, housing really has been a pretty profitable business in the postwar era. We have a very human tendency to overreact to startling news. You hear a story about a neighbor who bought a house and sold it five years later for a 50% profit and you remember it. Newsweek runs a story about the Southern California housing bubble of the 70s that jump started the Proposition 13 tax revolt and you remember it. Your property tax bill keeps showing a higher assessed value every year and you remember it. You hear about one square mile of Tokyo being more valuable than the entire state of Oregon and you remember it. But what you don’t remember is that another neighbor lost money on his house (he didn’t crow about it, after all) or that the Southern California housing market cooled off in the 80s (and the Detroit market had been falling the entire time) or that your assessed value is basically just tracking inflation (the math is too hard) or that the Tokyo story was bogus to begin with (and the Tokyo property bubble collapsed shortly after that anyway). And you never even notice the occasional story that provides the big picture in the first place — partly because they don’t often get written and partly because they’re not very interesting even when they are. So we end up retaining lots of bits and pieces suggesting that housing prices always rise and downplaying or not noticing the news that tells us otherwise. Add your own theories in comments. This really does seem like a belief that simply won’t die regardless of how much evidence there is to the contrary, and that’s something that’s probably distorted the housing market every bit as much as all the government intervention in the world.